So small that it conveniently fits in most travel kits, ACTIVE Skin Repair is a new trailside essential. ACTIVE Skin Repair Photo. For our first mountain bike trip of the season, a couple of buddies and I loaded into a truck and made the annual spring pilgrimage to Moab, Utah. Riding out there in the desert is a rite of passage, and somehow I managed to survive the many rock drops and exposed berms unscathed. Funny enough, it wasn’t till after all the technical gnar that I took a hard fall. On our way back home to Jackson, we made a quick pit stop in Salt Lake City. We had our sights set on quick lap down Bobsled, a fun flowy singletrack trail accessible from the city. The thing was, the consistency of the trail was wildly different from the trails we had been riding in the desert. Instead of sandy and shelfy rock, we pinned it down through loose gravel, something I failed to take into account when I erroneously grabbed my brakes for a quick stop. Launching over the handlebars, I lead with my face and arms to drag through the rocks and gravel. It was hilarious. I was giggling, my riding partners couldn’t contain their amusement—but what wasn’t funny was the road rash that resulted from the whole fiasco. Once the adrenaline had worn off, I began to feel the stinging, which lasted the whole drive home. Don’t get me started on how gnarly it looked when it started healing, or the lovely scar that I get to keep forever. This experience is one that I had accepted as inevitable, a choice that we as mountain bikers make when we decided to ride with rocks and other obstacles on the trail. 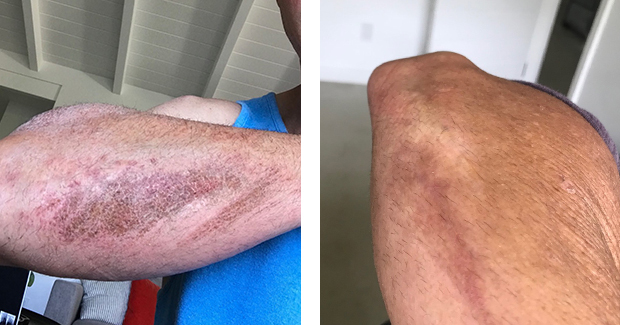 Though road rash won’t disappear anytime soon, it turns out my healing process could have been better had I put ACTIVE Skin Repair (ACTIVE), a medical grade skin and wound repair solution, into the equation. It’s the kind of product you want to have in your riding pack but hope to not to have to use. Lopes, who’s practically spent his whole life on his mountain bike, is no stranger to the gnarly injuries that come along with it. ACTIVE Skin Repair Photo. “I just like the convenience of the product. It’s non-toxic, it doesn’t sting, and it does so many things in one,” professional mountain biker Brian Lopes explained to me. Lopes, who’s spent the last 20 years carving out an impressive career on his mountain bike, is considered a legend within the sport with multiple world championships under his belt. Ooof—that had to have hurt. At least Lopes was prepared and quickly used ACTIVE on the resulting road rash. See the before and after for yourself. To understand exactly why it works, I spoke with Dr. Chris Prosser, who’s currently the Medical Director for the World Surf League (WSL). Prosser is no stranger to the world of action sports and the many injuries that come with it. His career has been defined by working with the elite of the industry at the X Games, Nitro Circus, and the WSL. While working in this environment can be at times intense and stressful, Prosser ultimately loves what he does. At the end of the day, he feels like these kinds of scenarios push him to be a better practitioner. “If [the athletes] around me are masters of their game, then I need to make sure I’m mastering mine,” he explained. Stephanie Gilmore, 6 time world champion, being treated with ACTIVE while on the WSL tour. As a result, Prosser is always looking for products and equipment to make his job more efficient and effective. ACTIVE was introduced to his team 18 months ago, and since acquiring samples of it, they’ve spent the last year and a half putting it to the test on tour. Their conclusion? “We found it really easy to use and that it works really efficiently,” said Prosser, and efficiency is key to making his day to day work much smoother. When I ask Prosser the best use they found for the product, it’s fairly difficult for him to give me just one answer. In reality, it’s their go-to for removing stitches, cleaning cuts from reefs, disinfecting wounds, reducing scarring, treating insect bites and sunburns, you can even use it as hand sanitizer, and Prosser joked how his team his is eager to find even more uses for it. His athletes are basically bathing in it. Such versatility almost feels too good to be true, but it’s ACTIVE’s greatest strength. The secret to their success is Hypochlorous Acid (HOCL), one of the main active ingredients in the spray. This isn’t some miracle ingredient, in fact, HOCL is actually a substance that is naturally produced by our white blood cells as a method to kill bacteria. “It’s no wonder it’s got multiple uses,” Prosser told me, in fact, he explained how ACTIVE simply capitalizes on our body’s own incredible healing processes of reducing inflammation and disinfecting wounds. At its core it does three things: kill 99.9% of bacteria, reduce skin inflammation, and accelerate the healing process. And after you break it down, how this spray works is nothing revolutionary but having it so accessible is a game changer. It’s actually the same medical-grade FDA-approved technology already used in hospitals now available in a convenient over-the-counter product. Lopes destroying a berm in southern California. Getting hurt in some capacity with these sports is practically inevitable, but having ACTIVE handy can at least help you be prepared. ACTIVE Skin Repair Photo. “Honestly, I love it because I can use it on my kids,” explained Lopes. 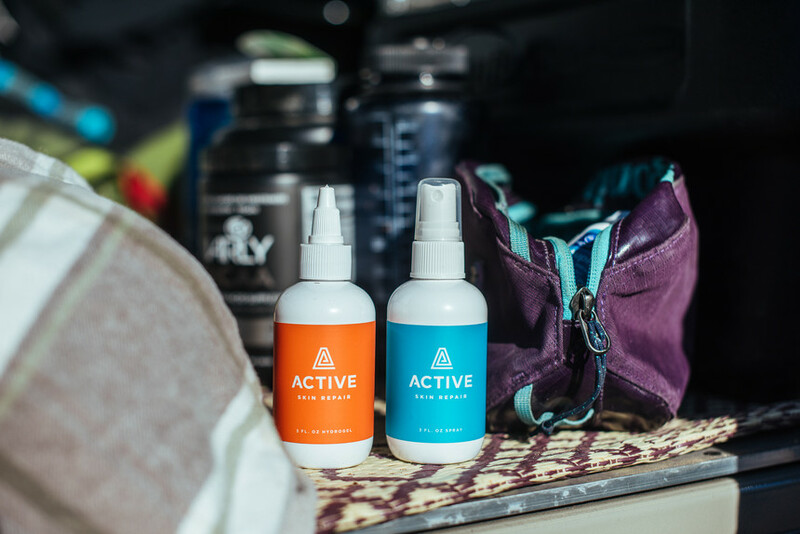 Unlike alcohol, hydrogen peroxide, and other first aid solutions, ACTIVE doesn’t sting, making it a much friendlier alternative for children. “Kids don’t like new things and they make a big deal out of everything when they’re hurt. Since this doesn’t sting, my son doesn’t even realize it when I’m putting it on his cuts.” I mentioned this in my discussion with Dr. Prosser, and he quickly agreed with Lopes’ sentiment. Many of the athletes on tour have families, and it’s become a staple product in their household. The reality is that getting hurt is an unfortunate consequence of our lifestyle, but being prepared for when it happens is well within our control. It’s a no-brainer for any outdoor enthusiast, whether you surf, mountain bike, or do anything outside to have a few bottles in your cabinet.